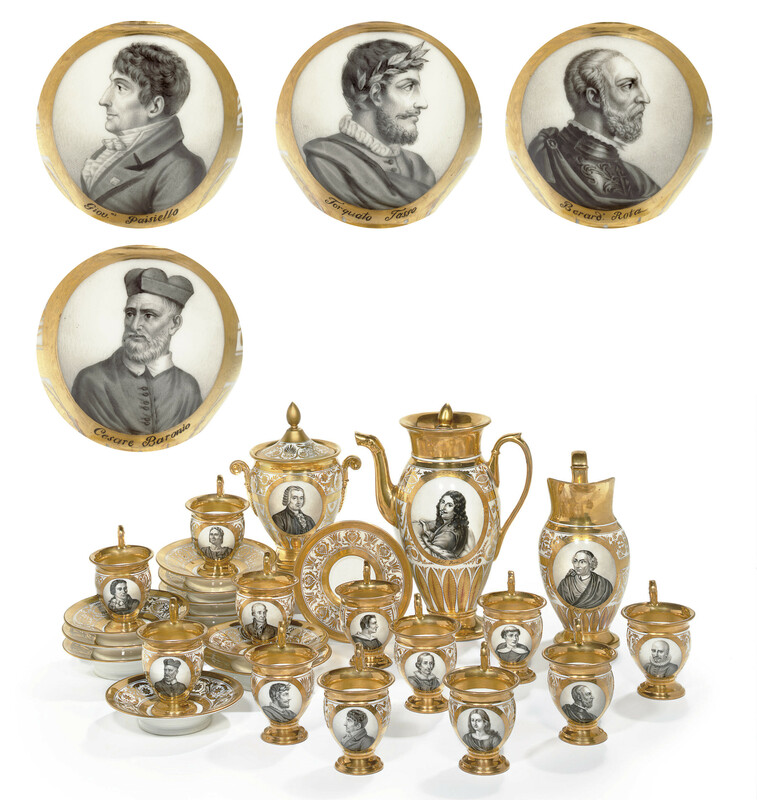 The portraits on the present service are based on engravings of noted Neapolitan figures from 13th century to the early 19th century. Celebrating a broad range of scientific and artistic thought, they cover many disciplines. However, the selection of male portraits is linked by two important factors: all are maverick creators breaking new ground in his given discipline and all can be tied at some point of their career to the city of Naples. History has recorded some as notorious villains while others are celebrated humanists remembered for their foresight and passion. For example, the 'Socerer Prince' Raimondo de Sangro, the Prince of San Severo, was a diabolical alchemist; Torquato Tasso was an epic poet who preserved the romance of Rinaldo and Tancredi; and Francesco Serao, a scientist and physician, disputed the rites of the Tarantella and musical exorcism while also being recorded as the first to use the word lava in connection with extruded magma in his account of the eruption of Mount Vesuvius. A complete listing of their dates and disciplines can be supplied by the Porcelain Department on request.